My mind is a-flutter with all the ills of the world: toxic air and water; floating plastic masses in violent, rising oceans; warring tribes; the attempt to suppress women; the disrespect of elders; the smugness of privileged others; the oppression of LGBTQ and People of Color; the maligning of refugees; our democracy's disruption; the suffering of unpaid workers taken hostage over a wall that most of us don't want; conceited cheaters, liars, fools running our government. And yet, for a moment the other day, I escaped into a different world, one where black and white became blue and green and red and gold, where silence was filled with music, talk and laughter, where enemies became friends, where troops from two nations surrendered to each other. This was a world where different languages converged yet people understood another, where fear and hatred melted into humility, camaraderie and concern. I saw this with my own eyes in the documentary, They Shall Not Grow Old. To make the movie, the director, writer, and producer of the Lord of the Rings and Hobbit trilogies transformed 100-year-old film footage from World War I by digitizing, colorizing and adding sound. The result is chilling—the looks in soldiers' clear eyes, the ravaged battlefield strewn with bloody, rotting bodies and razor wire, the muddy, lice- and rat-infested trenches, the histories told by veterans. What appeared on the big screen mesmerized. Most striking to me, however, was the part where British soldiers captured German ones. In no time, it seemed, the men and boys from opposite sides were communing with each other. Some of the Germans spoke a bit of English. They told their captors of their families, of their children, of their work. Neither side understood why they were fighting. The boys and men in khaki and gray-blue uniforms exchanged hats, shared cigarettes, ate together, helped the wounded in each other's ranks. I imagine, by finally understanding one another, they came to love each other as brothers. That night in bed I reflected on the film and on the recent social media frenzy around the interaction at the steps of the Lincoln Memorial between a handful of Black Israelites, a throng of Catholic high school boys wearing MAGA hats who'd been bused in from Kentucky to attend the March for Life, and a Native American elder who was there with others for an Indigenous People's March. 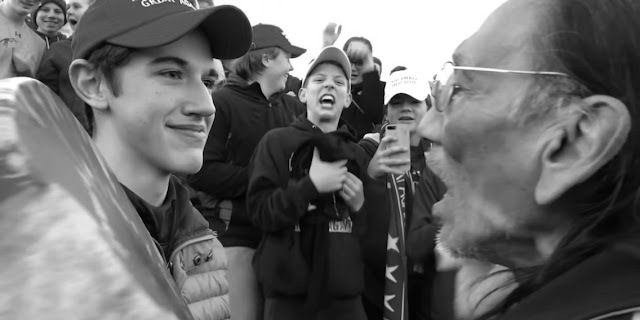 Several videos caught slurs and smirks, chants and taunts that were tossed between the bickering Israelites and amped-up mass of MAGA boys. It seemed the Native elder tried to intercede, tried to part the crowd with peaceful drumming. One boy did not yield. He stood his ground. He did not surrender. His classmates seemed to mock the elder. Across the Web, different takes and narratives bent opinions in one direction. Others bent them back again. Villains became heroes; heroes, villains. In my curious scouring of the coverage, I found this most compelling and thoughtful piece about the rumpus, written by Marcia Mount Shoop, an ordained Christian minister. And though I'm not religious, her piece says it all for me, and every White American would do well to read it. My thoughts drifted to the wall again. I imagined those hurting furloughed federal workers living on the verge of nothing with no pay for their labor. I thought about the people railing against migrants and refugees, insisting a wall is what we need. I pondered a president who fearmongers and vilifies refugees as hardened criminals while serially giving White Supremacists impunity. Like in the documentary I saw, I wish the folks who swear we need a wall could meet these frightened and fleeing migrants, could break bread with them, could share a cup of beer or wine, could surrender to each other; perhaps their hearts would become less hard. Perhaps they'd work to find a solution to aid their brethren save putting up a wall and razor wire. And just before I closed my eyes I thought of my disabled, non-verbal, autistic, seizure-racked boy, Calvin. So sweet. So mild. In ways, a foreigner from another tribe. I recalled what I sometimes ask and tell his classmates so they don't neglect, badmouth or mock him. "Can you guess why I think Calvin is the best person I know?" "Because he is your child?" some of them reply. "Because he deals with so much but is still happy?" others respond. "Nope," I say, "Calvin is the best person I know because he doesn't have a mean bone in his body and, no matter what, he loves everyone." The students usually fall silent. I go on to implore them to be kind and generous, to befriend others who are different from themselves—ones with different colored skin, different hair, ones who come from different nations, who speak different languages, who look, sound, dress, act, live, love and worship differently. "We all have the same heart inside," I end, hoping they'll surrender. dear anonymous, we don't have cable and we don't watch television except the PBS news hour once in a blue moon. facebook, however, is a vice. i could definitely disengage a bit from that. thanks for your concern.